Address: The Granary, Quay Lane, Sudbury, Suffolk, CO10 2AN – Click here for link to Google Maps. 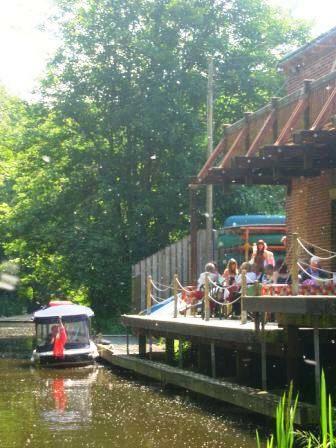 Our riverside Tea Room at The Granary is run by volunteers as the perfect accompaniment to a river trip (click here for more information) with proceeds going towards the restoration and conservation of the River Stour Navigation. We serve hot and cold drinks, delicious homemade cake and light lunches (usually sandwiches and toasties, sometimes soups and quiches- no lunch items on Wednesday afternoons). On a nice day we recommend making the most of our riverside location by sitting out on the decking area. It overlooks the Granary Cut, Mayor’s Walk and the woodland, Eden-Rose Coppice. Lunch items are freshly prepared to order with ingredients locally sourced whenever possible. The River Stour Trust is a supporter of Fairtrade and we invite you to enjoy our Fairtrade range at The Granary Tea Room. The Sudbury Fairtrade Town Steering Group have worked towards achieving the official Fairtrade Town status for Sudbury which now joins over five hundred towns in the UK that have made a commitment to supporting Fairtrade and using products with the Fairtrade Mark.